Designer Melissa Warner Rothblum shares her wisdom for decor that children can grow up with—not out of. Blue for boys and a set of superhero sheets. Pink for girls, plus a frilly dust ruffle. Such old-fashioned design parameters just won’t cut it for today’s youngsters—or their parents. “Clients are looking at kids’ rooms as an opportunity to do something whimsical and different that they may not wish to do elsewhere in the house,” explains designer Melissa Warner Rothblum of the Los Angeles– and Seattle-based firm Massucco Warner Miller Interior Design. “It’s a safe place to do something fun.” Fun with serious functionality, of course. “Aside from looking great, kids’ rooms have specific requirements when it comes to both visible and hidden storage, as well as an open, comfortable area for play,” says Warner Rothblum, mom to a 2-year-old herself. “Versatility in space planning is also important. For example, making sure there’s room for a desk, even if children are too little for homework now.” Ahead, Warner Rothblum shows how to create environments that are cool, not cutesy, and easily adaptable as kids grow from toddlers to teens. While the rustic vibe suits a client’s Deer Valley, Utah, vacation home, the industrial feel of the bunk beds and sconces keeps it from veering hokey or juvenile. “I prefer not to do themes or tie decor to a child’s particular interest because that can get dated quite quickly,” Warner Rothblum says. 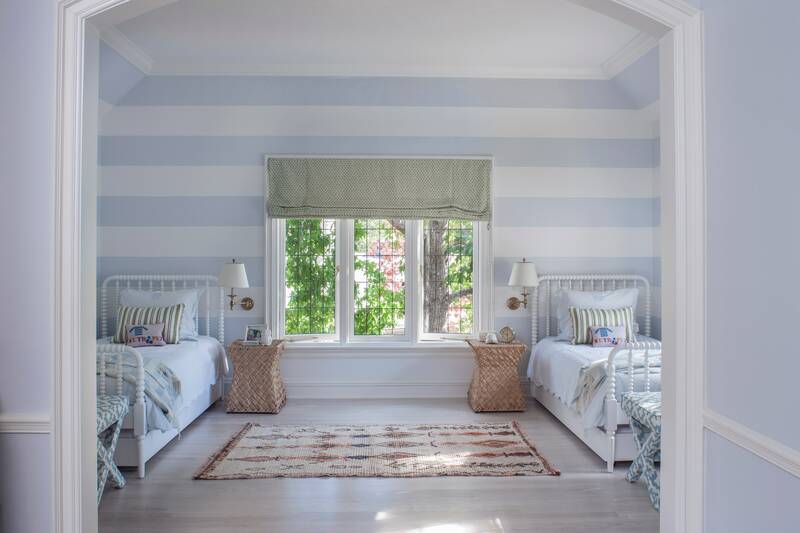 With bold stripes on the textiles and locally sourced touches like the blue-legged bench, this room has a playful appeal that suits the family’s offspring, who range in age from 5 to 13. Light colors contrast against the deep blue walls—a smart paint choice to hide dirt. Designing for sister-and-brother roomies can be especially tricky. Warner Rothblum kept things classic (and gender-neutral) with simple lines and pale, soothing colors in this Montecito, California, bedroom. At 180 square feet, it’s large enough for two (close quarters can breed bickering, as any parent will tell you), but horizontal stripes help ground the height of the 10-foot ceilings for a cozy feel. 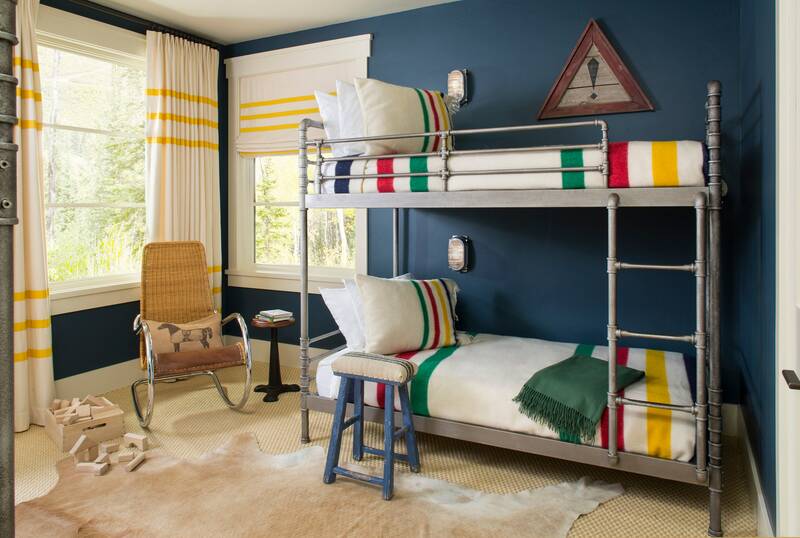 Jenny Lind–style beds boast trundles for sleepovers, and the vintage wool rug between them invites kids to sit on the floor and play. Though designed for a girl now age 7, this lovely nook with a headboard upholstered in Quadrille fabric could easily see the San Francisco child through adolescence. “The secret is to go classic with the main elements—the bed, seating, etc.—and add personality with art and accessories that can be swapped out over time,” Warner Rothblum explains, noting that the cameo pillows depict the child at the time the room was done. At just 10 feet wide, the space presented a storage challenge that was admirably met with a bed/bookshelf built-in. Special items go on display while deep drawers keep messy stuff like art supplies out of view. The palette sticks to two brights plus white to avoid color overload when dolls, toys, and collections enter the mix.